Outer layers of the human skin may only be 10-20 µm thick but pose a major barrier to transdermal delivery of drugs, vaccines and other pharmaceutical agents. In recent years, micro-needle technology has come of age for drug delivery and neuro-stimulation. Consumer devices are now available for everyday applications like insulin injection, and expansion to a wide range of applications is around the corner. Micralyne has fabricated micro-needle devices ranging in height from 100-500 µm, and developed a manufacturing platform to provide various shapes and dimensions to achieve the micro-needle array that fits the application. Development and proof-of-concept units can be provided for various applications with materials such as silicon, titanium and other exotic metals and coatings. Micro-needles enabled by MEMS processing offer the ability to interface at a cellular-scale with the human-body and are rapidly emerging as therapeutic and drug delivery platforms that replace traditional syringe based injections and also enabling a new generation of medtech. 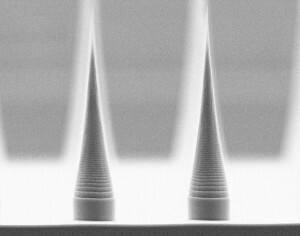 "By fabricating these needles on a silicon substrate, because of their small size, thousands of needles can be fabricated on a single wafer. This leads to high accuracy, good reproducibility, and a moderate fabrication cost."